Ten $500 awards that can be used towards educational costs at NOVA will be given away throughout the 2018-2019 academic year to randomly selected students who successfully complete Inceptia’s Financial Avenue courses online by the deadlines indicated below. Courses only take about 45 minutes to complete and provide students with knowledge of key personal finance concepts and a customized action plan based on their financial goals. Provide your NOVA student email address (ending in @email.vccs.edu) during the registration process and provide your 7-digit NOVA student ID# when creating your new student account. Log in to Financial Avenue as a student at https://fa.financialavenue.org/fa-login/ using the username and password you created in the step above. 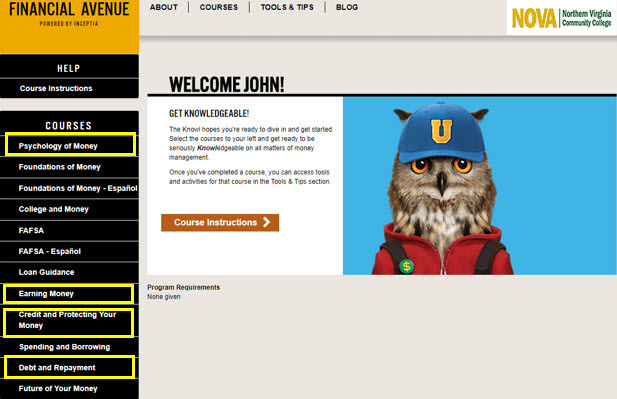 Under “Courses” on the left side of the webpage select the course you would like to complete. Follow the prompts until you complete the course. Complete the course with an average score of at least 70% by the deadline shown below to be entered into the CashContest drawing for that course. – The “Credit and Protecting Your Money” course must be completed before 11:59pm on October 16, 2018. – The “Debt and Repayment” course must be completed before 11:59pm on December 18, 2018. – The “Psychology of Money” course must be completed before 11:59pm on March 8, 2019. – The “Earning Money” course must be completed before 11:59pm on May 1, 2019. – Complete all four courses listed above before 11:59pm on May 1, 2019 to be entered in the final comprehensive drawing. You must be pursuing a degree or certificate at NOVA and enrolled in at least six credits that are applicable to your program during the semester the drawings take place in order to be entered in the drawings. For the “Credit and Protecting Your Money” and/or the “Debt and Repayment” drawing, you must be attending at least six credits required for your program during Fall 2018. For the “Psychology of Money”, the “Earning Money” drawing and/or the final comprehensive drawing, you must be attending at least six credits required for your program during Spring 2019. There will be two $500 drawings for each of the four courses shortly after the due date to randomly select students who meet the requirements outlined above. There will also be a final comprehensive drawing to select two $500 winners who successfully completed all four courses before May 1, 2019. Students who are selected to receive a $500 award will be notified via their NOVA student email account within 30 days after the deadline for completing the course. If the $500 award is applied toward a student’s NOVA account and if the student has a $0 balance at that time, then it will create a credit balance that is refunded in accordance with the College’s refund policies. Students may set up their refund preferences at https://nvcc.afford.com/refunds. Over-awards created by the additional award, though unlikely, would be resolved in the best interest of the student. Please note that students are permitted to retake course quizzes and even an entire course if necessary to improve their average course score to at least 70% to be entered into the drawings. However, students will not receive multiple drawing entries for successfully completing a particular course more than once. This contest is open to all NOVA students who meet the requirements outlined above. However, please note that NOVA faculty and staff who happen to be taking classes at NOVA are not eligible for the $500 drawings. Odds of winning a $500 award will depend on how many students successfully complete each course. NOVA reserves the right to modify the CashContest at any time. If you have any questions about the CashContest or the drawings, please contact the 24 Hour Student Support Center at 1-855-323-3199. The courses that you may complete at https://fa.financialavenue.org/fa-login/ to be entered in the 18-19 CashContest are highlighted below.